If art is communication, it is also metaphysics. These two artists ask and answer the question in their work, “What is the real?” Though the show at Berggruen is probably not the best introduction to the work of either artist, it does contain two interesting pieces. Judd’s Untitled (l99l), a series of twelve extruded and anodized aluminum wall reliefs, is an unusual progression based on color. McCracken’s Go(2005) is a recent small triangle sculpture of lacquer, polyester resin and fiberglass on plywood. 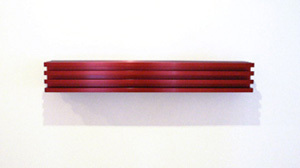 Donald Judd came from the “Show Me State” of Missouri. He studied philosophy at Columbia University and, early on, wrote reviews of contemporary art. In his sculpture, he worked with the unit of the box because he believed in intelligence and the logic of structure. He wanted to make structure transparent. He thereby charged structure with meaning. At Chinati Foundation, in 100 Milled Aluminum Boxes, Judd divides boxes in their interior volumes in 100 different ways. Installed in two former artillery sheds whose long sides he opened, front to back, with large, square windows, 100 Milled Aluminum Boxes is bathed in changing desert light. The aluminum and the light transform the piece from a discourse on structural logic into a celebration of change, variation and flux playing over an essential structural simplicity. Fully revealed form becomes meaning and meaning becomes numinous. Usually, Judd’s anodized aluminum wall reliefs are closed yet hollow boxes arranged in progression supporting a linear, open extended box that attaches the relief to the wall. 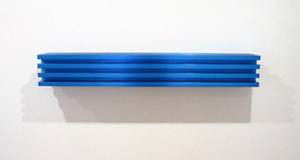 In them, Judd explores color more than in any of his other work. Anodizing is an industrial process by which a light metal is coated with a protective colored film by being suspended in a liquid pigment through which an electric current is passed. The electric current charges the metal, aluminum, with color. This is a scientific and highly impersonal process in which painting becomes coating. It is a process by which the aluminum support, coated with a thin film of color, charges the color with light. Extrusion is a process by which a light metal is either die cast or hole punched. In this case, the mold or die was quite complex. The shape that results has a front and a back which directly reflect each other, the support being the same as the exterior form of the relief. An unusual number of the colors in Judd’s work at Berggruen are earth tones: wine red, olive brown, red brown, black green. These colors and a clear aluminum relief face the viewer entering the gallery. The earth colors have an opacity that makes them appear to be solid forms, striped solid blocks of pigment. The clear aluminum relief gives the lie to this perception. Catching the light from Berggruen’s many windows, it appears to be the light, open form that it is. John McCracken is not a New York artist. Born in Berkeley, he spent most of his artist life in Los Angeles as part of the Finish Fetish group around Ferus Gallery. He is now residing in the UFO regions of New Mexico. His work, however, runs parallel to New York Minimalism and shares concerns with simple form, seriality, new industrial materials, color, and the effects of charging space with repeated forms. Last October, there was a McCracken exhibition at Zwirner & Wirth, New York, curated by Matthew Higgs, formerly of CCA Wattis Institute. It contained many of McCracken’s tropes at their best: small cubes, a large floor-standing cube, a wall-mounted piece, and many planks. The show revealed that if you approach McCracken as a colorist, you are going to be confused. His pieces are more about materials, and through his materials’ reflectivity, they are about space. Color, with McCracken is a sensuous lead-in. Then the works’ reflections take over, mirroring of the outside, including the viewer, within the interior volume. The large back room at Zwirner & Wirth was filled with ranks of planks arrayed along both long walls surrounding a large black floor-standing cube. Like Barnett Newman’s paintings, McCracken’s planks are meant to be colors and spaces in which viewers will locate themselves. In this installation they had a hieratic presence. There are two planks at Berggruen. Related to wall and floor, sites of painting and sculpture, the planks have totemic, ritualistic significance. They are charged with an energy which comes from the importance of their location. The intensity of their handmade process also charges them. Human touch does still signify. I think of them as related to Dogon ladders and Brancusi’s Infinite Column, connecting earth and heaven, at least symbolically. The narrow, smoky cerulean blue plank at Berggruen, Path(1988-92), is indeed a path. Employing perspective and a highly polished surface of polyester resin, McCracken dematerializes the concrete, taking the viewer into infinite space. On the other hand, KA-WHO-SO (l985), is a decorative illustration of McCracken’s program; it is an illustration of cosmic space. The small front room at Zwirner & Wirth was filled with seven small, highly colored cubes on pedestals surmounted by a medium-size cadmium yellow wall relief. The volumes of the reflective, small cubes were transformed into infinite spaces where the outside became inside and the inside opened into cosmic colored space. They had a numinous presence, still and changing at once. Go (2005), at Berggruen, changes from different angles, appearing , at first, to be a thin, two-dimensional picture plane, at times black, at times milky, at others clear and almost disappearing. At the sharp-angled corners, the piece becomes three-dimensional. 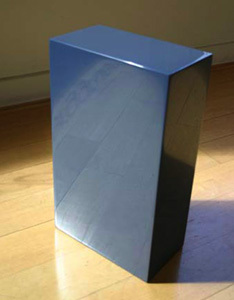 Reflections of the pedestal create rectangular and triangular shapes and spaces within the planes as the black yields to white reflection or clear mirroring. The only stable shape is the top plane. Otherwise, the mystic triangle takes the viewer into an ambiguous and changing space. The triangles tend to be the most elusive of McCracken’s forms. He employs new industrial materials to reveal that simple objects perceived to be discrete objects mirror the outside and, by mirroring the outside within themselves, contain huge infinite spaces. Both Judd and McCracken were attracted to simple shapes and forms. Both also were attracted to opulent color and industrial materials, which changed simplicity or plainness into something both more hieratic, seductive and illusionary. Further, their interest in ancient art and architecture reinforces their sense that form has meaning inherently. With McCracken, the intent begins and ends with a kind of mystic creation of discrete objects in materials that reveal that the outside is inside and the inside is cosmic space. Through his labor, through the high polish of his materials, McCracken practices meditation. Following the simple leads to knowledge of the real. New materials — Plexiglass, for instance — and the desert changed Judd’s work. His installation of the 100 Milled Aluminum Boxes and of the large concrete boxes at Chinati, show this. The structural logic inherent in both works, is transformed by their installation, one in buildings renovated by Judd himself, the other by his placement of it in the light of the desert landscape. What began for Judd as an intention to reveal truths of structure became a revelation of structural truth within the flux of life. — Gloria Tanchelev is an artist based in the Bay Area.